Former Husker linebacker Will Compton, No. 51, has gone from undrafted free agent to team captain in four seasons with Washington. LINCOLN — Will Compton was starting to believe his first NFL training camp might be his last. The former Nebraska linebacker already was running uphill as an undrafted free agent, a hard road that a host of former Huskers are staring at right now. Compton was at the bottom of the Washington Redskins’ depth chart in 2013, with a bad hamstring making it hard to do anything about it. The NFL also was proving to be an even more ruthless and businesslike place than he could have imagined. “You find out that they don’t know as much about you as you think they did, and they don’t care,” Compton said. “It’s not like college, where they’re invested in you. It wasn’t long before a hometown friend and his wife came to visit that August, and Compton was sitting in their room at the Super 8 and sharing some deep thoughts during an off day. Compton, 27, is coming off his best season as a pro, making a career-high 104 tackles (60 solo) with two fumble recoveries and an interception in 15 starts. He was voted a Redskins co-captain in 2016 — a nod to his communication and leadership skills at the middle linebacker spot but also his place in the locker room — and cornerback Josh Norman was the only Washington defender to play more snaps than his 938. The Redskins then chose to re-sign him as a restricted free agent just before the NFL draft, a contract that will pay Compton a reported $1.8 million in 2017. “I definitely couldn’t have forecast this,” he said. The same would go for many others. Compton spent that first season on the Washington practice squad until being activated for the final game. Each following year included a bump in his starts and production. Along the way, Compton not only outlasted the down times but started becoming someone teammates would respect and follow, even before he became a captain. Compton is big on reading and drawing inspiration from motivational speakers. It’s something he could even see himself doing down the line, along with coaching. The here and now, though, is a role with the Redskins that he labored to carve out, through long hours of film study, fine-tuning of his football IQ and always working physically to improve. This offseason he spent time with London Fletcher, who finished a 14-year NFL career with Washington in 2013 when Compton was a rookie. The Redskins fired defensive coordinator Joe Barry after last season, but maintained some continuity by promoting outside linebackers coach Greg Manusky. They then added Pro Bowl inside linebacker Zach Brown in the offseason to go with Compton and Mason Foster. With the first minicamp coming on May 23, the focus is on bouncing back from an 8-7-1 season after Washington had made the NFC playoffs the season before. “Our expectations are high,” Compton said. “I feel like we’re putting together a good puzzle, as far as getting things in order, and our job is to carry out the culture. If we take care of that foundation, the wins and losses take care of themselves. 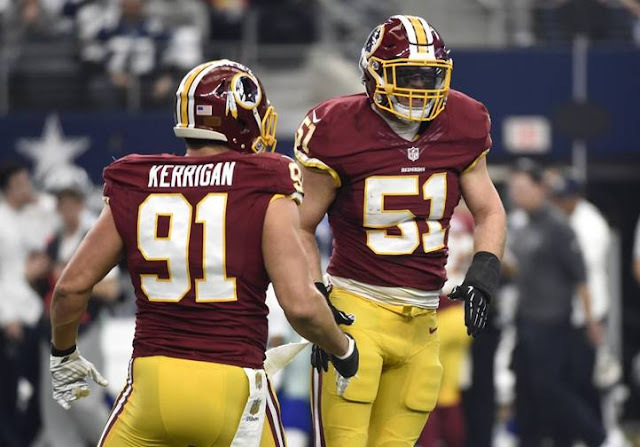 Compton knew it wasn’t a given that he would be back with the Redskins, and there was at least a rough draft of a Plan B going through his mind as he rehabbed a PCL injury to his right knee that nagged him over the final two games of last season. Restricted free agency gave him the right to negotiate with other teams, but Washington reserved the right to match any offers within seven days. Compton didn’t hesitate to re-sign. Compton remembers his NFL introduction well enough to understand what’s ahead for nearly a dozen former Huskers starting free-agent journeys. Josh Banderas is the latest NU linebacker trying to go the undrafted route after Compton, Zaire Anderson, Trevor Roach and Eric Martin have made NFL rosters in recent seasons. Compton said fifth-round pick Nate Gerry reached out to him after the draft, too, and asked if he had advice to share. Aside from the obvious of buckling your chin strap and going to work, Compton said, it often comes back to your state of mind. He knows that from being there a few summers back. “There could be a lot of negatives that enter your mind — that you can play at this level, or the way you’re getting coached, or the limited chances you might get,” he said. “The main thing is don’t doubt yourself. It’s all about your self-talk. The way you talk to yourself every day. It’s all about how you feed your mind.